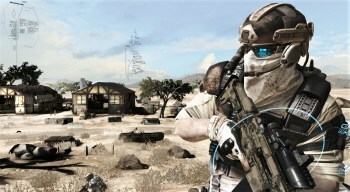 PC gamers are going to have to wait a little while longer to get their hands on Ghost Recon: Future Soldier. For some reason, this strikes me as perfectly appropriate and oddly uplifting. After a wild ride that saw it canceled completely, replaced with a free-to-play online game and then revived, albeit without a release date until just a couple of months ago, the launch of the PC version of Ghost Recon: Future Soldier was just a couple of days away. And now, with an almost giddy inevitability, it's been delayed. The good news for Ghost Recon fans is that the delay is a relatively short one: just a couple of weeks, in fact. "The US launch date is scheduled for June 26th in North America and the 28th in Europe," a Ubisoft rep confirmed. As for why it's delayed, nobody knows - or at least, nobody who does know is willing to say. It's a bit late in the process to be worrying about problems in development, although a couple of weeks might be adequate if it just needs a little more polish, but I think the smart money is on piracy, specifically with regard to Ubisoft's occasionally heavy-handed approach to fighting it. Since the PC is seen as the platform most vulnerable to piracy, PC editions are sometimes held back a few weeks to help ensure that the more lucrative console versions aren't cut off at the knees. I don't know if it's a particularly effective strategy, but I suspect that doesn't necessarily matter, either.